The Revolutionary War battle at Ramsour's Mill in Lincoln County took place on 20 June 1780. With the American surrender of Charles Towne (present-day Charleston, S.C.) on 12 May 1780, British military control of South Carolina and Georgia was virtually complete. North Carolina, which had been spared warfare since the Battle of Moore's Creek Bridge four years earlier, appeared to be the next objective of British commander Lord Charles Cornwallis and his 8,345-man army. While Cornwallis was content to spend the summer in Charles Towne, giving his troops an opportunity to rest and resupply, two of his American officers, Lt. Col. John Moore and Maj. Nicholas Welch, were anxious to pave the way for the invasion of their home state. In early June Moore and Welch returned from service in South Carolina and promptly set about organizing a band of Loyalists, or Tories, to aid in the British conquest of North Carolina. On 13 June the Loyalists recruited by the two officers began to assemble in Lincoln County at Ramsour's Mill on the north side of present-day Lincolnton, about seven miles west of the homes of Moore and Welch. On receiving the news of the massing Loyalists, Gen. Griffith Rutherford sent word to Col. Francis Locke of Rowan County and Maj. Robert Wilson of Mecklenburg County to gather a force to disperse the Loyalists. On the night of 19 June, with 400 poorly trained, ill-equipped militiamen from Rowan, Mecklenburg, and Lincoln Counties, Locke set out from his camp on Mountain Creek for Ramsour's Mill, some 15 miles away. Meanwhile, the number of Tories camped on the wooded hill 300 yards from the mill had grown to 1,300, although one-fourth of them had no weapons. As he neared the site of the Tory encampment in the predawn hours of 20 June, Locke was greeted by Adam Reep, a local Patriot who had scouted and monitored the Loyalists' activities. Once Reep had supplied him with information about enemy troop strength and local terrain, Locke decided to launch an attack against the unsuspecting Tories. With cavalrymen out front, the Patriots began their ascent of the east side of the hill at first light. Fog limited visibility to 50 feet. Although momentarily caught off guard, the Tories rallied, and a savage battle raged for almost two hours. Brother against brother, neighbor against neighbor, the men fought in mortal hand-to-hand combat. In this civil war, there were no uniforms. To identify themselves, the Patriots pinned white paper on their hats while the Tories stuck green twigs in theirs. Although they outnumbered the Patriots by more than three to one, the Tories were routed and fled down the west side of the hill toward the mill. When the fog lifted and the smoke cleared, the battlefield revealed more than 70 dead and 200 wounded, equally divided between the two sides. The unclaimed dead were buried in a mass grave on the hill. 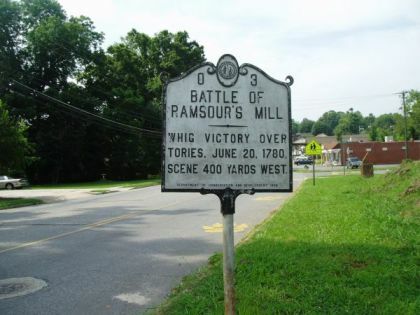 The Battle of Ramsour's Mill effectively disrupted Tory support for the British war effort in the region. Not only did it rob Cornwallis of badly needed Loyalist assistance when he crossed into North Carolina; it also provided the impetus and inspiration for the crucial Patriot victory that was to follow less than 30 miles away at the Battle of King's Mountain on 7 Oct. 1780. Although much of the battlefield is now covered with public school buildings, the mass grave site and the graves of several of the officers who fell in the battle have been marked through the efforts of historical groups and individuals. William A. Graham, "The Battle of Ramsour's Mill," North Carolina Booklet 4 (June 1904). William Sherrill, Annals of Lincoln County (1937). Battle of Ramsour's Mill NC Historical Marker I-37. Image courtesy of the North Carolina Office of Archives & History. Available from http://www.ncmarkers.com/marker_photo.aspx?sf=b&id=I-37 (accessed June 1, 2012). When the cavalry leading the Patriot column approached, the Loyalist sentries on the road fired at them and retreated to their main body. After an initial cavalry charge, the Patriot infantry moved up. In the confusion of the battle, the Patriots were able to turn the Loyalist's flank and gain control of the ridge. General Rutherford, then only a few miles from Ramsour's Mill, received word of the action and immediately dispatched his cavalry to assist and hurried the infantry along. Patriot Colonel Francis Locke was unable to reform his line on the ridge and ordered his men to fall back. However, Captain John Dickey refused and led his company to higher ground, where their rifle marksmanship turned the battle into victory. When ordered to retreat by Colonel Locke, he had soundly cursed (Presbyterian elder though he was), saying he would not retreat. Captain Dickey was credited with saving the day at the Battle of Ramsour's Mill. Which made our old hero mightily storm." Maj. Joseph McDowell, brother of Col. Charles McDowell, sent Adam Rieb (Reep) to inform General Griffith Rutherford of the gathering of the Tories at Ramsours Mill and then was sent into SC disguised as Quaker to warn Lt. John Moore, the patriot fighting with Francis Marion, about the possibility of being cut off. He then met about 30 of Maj. Daniel McKissic's mounted minutemen at Ramsey's Ford around midnight the morning of the battle and proceeded to lead this party to join Col. Locke about two miles east of the Tory encampment. The account of the Battle has a lot of details which I have. Does anyone know if a list of soldiers in the battle exists anywhere? Thank you! This information is from the Wallace Monroe Reinhardt Papers original quill writing of 1880 who had interviewed Capt. Adam Rieb (Reep) between the time he was 12 to 17 which was 1830 to 1835. W.M. Reinhardt was the son of Michael Reinhardt-Mill Owner the son of Christian Reinhardt.